Idle Hands Empty Brain ...: Road Trip!! 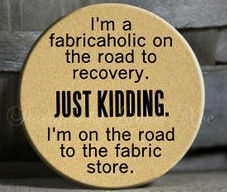 It has become a summer tradition and a fun one :) Gathered a couple of quilt friends and do a road trip - Yippee!! We've been so lucky to have great weather, and this year was no exception - sunny and not too hot! We started off at Mount Brydges Sew Creative quilt store where I managed to find 2 "sky" fabrics, just what I needed to finish off the last McKenna Ryan cat wall hangings. I also picked up a cute Bunnies fat quarter. Then off to Strathroy for a hour tour of their antique mart. Mibs was into whites - she found a nice pair of white gloves and a white doll bed. Meanwhile I left the premises with a drawer from an old treadle sewing machine! Lunch at the Coffee Culture, then on to Wyoming to visit Stitchaire, a newish quilt store. BTW, that's Wyoming Ontario, a small village in SW Ontario. We all found something to purchase :). Susan got some cute Dr Who fabric to make a gift for one of her Geocaching friends, Ann found some lovely Red, Grey and White fabric for a lap quilt for her niece. Mibs and I got fat quarters. I also purchased a fat quarter of Trailer fabric - you can see the fabric in this lovely apron they had a the front door. I gave Mibs the trailer fat quarter as a thank you for being our driver for the day. Mibs spends her summers commuting between home and her summer residence (a trailer). This morning I've been following Simone (she who can not be touched) all around the house. It's Vet time and she must be tranquilized before she'll go in the carrier. It's traumatic for both of us but I managed to nab her and she's now in the carrier sitting quietly, and it's only 11:45! She'll be going in for her shots around 2:00. That's another day of vacation time doing chores! I've spend much of this year's vacation doing family stuff and housework :(. Last weekend we celebrated a nephew's 35th Bday hence the cake. I'll be making another next week as it's my turn to host our Sew What's group :). I have also been doing my Spring cleaning - I guess that should be Summer cleaning - FINALLY. Took out 9 bags of shredded paper this week and donated 3 magazine boxes of Quilting Arts to a friend. Have done 2 trips to the Goodwill, one more to go - Feeling very self righteous - or at least cleaner ;). Consequently not much sewing has been accomplished - yet. But I did manage to make up this sleeping mask. Recognize the fabric? It's leftover from the mater's wallet. One more week of vacation time. We're taking the mater shopping at the mall and off to do her driving test. Taking the pater & partner to Sarnia for the annual Family picnic, a lunch with the niece, grand niece, sister and the mater, and of course the "Ladies" of Sew What's - so next week will be busy busy!! Posted by Idle hands, empty brain ... at 11:19 a.m.